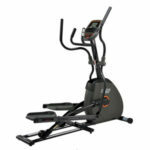 AFG Fitness offers several elliptical trainer models with different specs and price ranges. The AFG 2.5AE is one of the most affordable models, currently available for less than $650. It’s a machine with a flat range of motion, eddy current resistance, offering 12 distinctive workout programs. It has a construction similar to the Schwinn 430, but as opposed to this models, it doesn’t have an incline system. The AFG 2.5AE elliptical trainer is a rather large fitness machine, with a footprint taking 68″L x 22″W (173 x 56 cm) of floor space. It’s also rather heavy, weighing 145 lbs (66 kg) when fully assembled. However, its front base integrates a set of rollers, which facilitate its relocation if needed, once you’ve finished your workout. Its middle and rear bases integrate small, adjustable stabilizers with rubber caps, which enhance the stability of the machine. This being said, the machine offers excellent sturdiness and stability, without rocking or moving, even if you engage in a more demanding workout. The frame does not have a folding design. It’s quite sturdy though, being made of steel tubing. All its steel parts are double coated with anti-corrosive paint, in black color, this being the only color available at the moment. The machine’s rails consist of two aluminium sheets placed over the rear steel tubes of the frame. Along with the rollers, they’re designed to minimize noise, promoting a smoother motion. The rollers integrate sealed ball bearings, and feature a very sturdy polymer coating. Differently put, these rollers are made to last. The pedals feature a fairly simple construction. They’re made of heavy-duty PVC material, being able to support users up to 275 lbs (125 kg). They don’t integrate any suspension, however the pedaling motion is still shock-free, much safer than running on a treadmill, for example. Also, one important aspect to mention regarding the pedals of this elliptical trainer, it their Q Factor. The distance between them is fairly short compared with other models, which means your feet positioning is natural, not awkward as for other models, aspect that also eliminates the extra lateral stress on the knees. 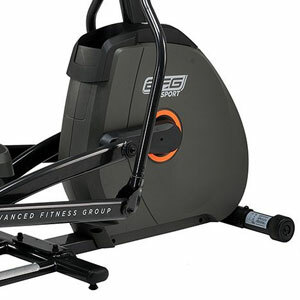 Like most elliptical machines of this type, the AFG 2.5AE features two sets of handlebars: mobile and fixed. The mobile bars have a rather simple design, but they do offer multiple grip possibilities. The fixed handlebars integrate pulse sensors, the console being able to track heart rate if you hold onto them. Both types of bars are covered by a sheet of rubber foam, providing the required amount of comfort. Finally, the joints between the machine’s arms, pedal bars and upright console mast, integrate heavy-duty ball bearings. This being said, it’s less likely for it to develop squeaky noises, while the motion is really smooth and steady. 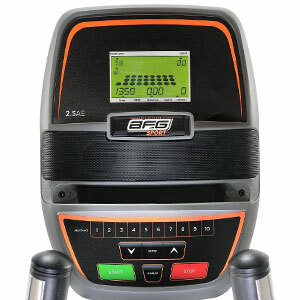 As we’ve mentioned above, the AFG 2.5AE elliptical doesn’t have an incline system, which is quite a minus for a machine within this price range. It offers a medium-size stride of 18″ (45.7 cm), which means it’s a machine for users between 5’0″ and 6’0″ (152 – 183 cm). Evidently, taller users can also use it, but the range of motion may feel a bit short for them. In case you’re wondering, the top of the pedals at their closest point to the floor is at approx. 10″ (26 cm) above floor level, while at their highest point, they supply an elevation for the user of approx. 15″ (38 cm). Therefore, in order to eliminate any ceiling height issues, make sure that the ceiling in the room where the the machine will be in use is at least 20″ inches higher than your own weight. 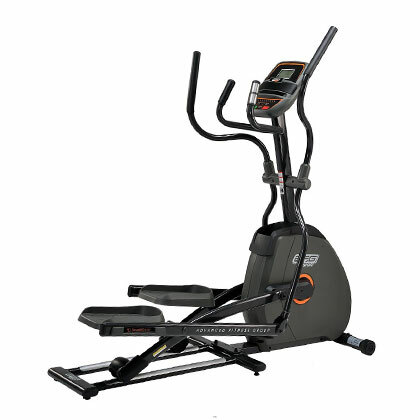 This Advanced Fitness Group elliptical trainer features an eddy current, motor assisted resistance system. This means it requires to be connected to a 110 – 120 v power circuit in order for the console to become operational. Also, the resistance is controlled exclusively from the console. As you select one of the resistance settings, the servo motor will shift the magnets’ pull onto the flywheel, adding or reducing resistance. Also, in case you use one of the on-board workout programs, the resistance on the machine will change automatically. The machine offers 10 distinctive resistance levels. Resistance can be adjusted from the arrow keys, or from the quick keys from 1 to 10 on the console unit. By default, the machine is set onto the resistance level 1, which promotes a light workout. Conversely, the top levels of resistance add quite a bit of intensity to the workout, being excellent for increasing strength, stamina, and weight loss. When it comes to the machine’s drive system, we can say that it’s equipped with a balanced, 14.3 lbs (6.5 kg) flywheel, which supplies a very smooth pedaling motion. Although it’s not the heaviest flywheel that you’ll find in an elliptical trainer, due to its construction it does supply a steady and consistent stride. The transmission between the pulley and the flywheel is made available by a heavy-duty v-belt. As a general idea, a belt drive system is much quieter than a chain drive, and also does not require any maintenance. 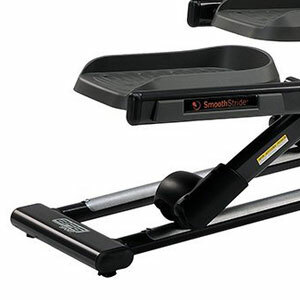 The console unit supplied with this AFG elliptical trainer does not offer fancy features, such as online connectivity, or Bluetooth capabilities. However, it still has much more to offer than the average basic unit. First of all, it features a 5-inch, LCD display, which can monitor time, RPM, watts, distance (in miles only), speed (MPH only), calories burned and heart rate, showing most of these values simultaneously, rather than one at the time. Of course, it also indicates the current resistance setting, and the current program in use, along with its segments. Pulse can only be read if you hold onto the sensors of the stationary handlebars. It cannot read it via a HR chest strap transmitter. The unit has 12 pre-set workouts, for weight loss, intervals, reverse pedaling, calorie-oriented, watts or random. Some of these programs offer several levels of difficulty, so that you can always have a challenge to beat, and to keep you motivated. Evidently, there’s also a manual program, which gives you the possibility to stride freely, and adjust resistance as you please. In terms of amenities, the console unit integrates a sound system which consists of two small speakers. This sound system is compatible with most MP3 devices, smartphones or tablets. The sound rendered by it evidently can’t be compared to the sound rendered by a dedicated subwoofer. However, it’s considerably superior to the sound produced by the average smartphone or tablet speakers. Also, an audio adapter cable for the sound system is supplied with the machine. The console also integrates a reading rack and a small compartment for your MP3 unit or smartphone. The reading rack is wide and solid enough to hold just about any tablet. All in all, the console is fairly easy to use, with intuitive commands. It has Start and Stop buttons, in case you want to alternate elliptical workouts with other workouts without losing the workout data on the elliptical. It features quick and gradual resistance adjustment keys for extra convenience. It has a sleep mode in which will automatically enter after 15 minutes of inactivity on the machine. It’s also powered on when it detects movement on the pedals, or by pressing any key. The manual supplied with the AFG 2.5AE elliptical machine provides clear and concise, step-by-step assembly instructions. Differently put, the assembly of the machine is a straightforward task. You basically have to attach the rear and the front frame parts, add the front stabilizer, the pedal and mobile arms, console mast, console and several protective covers. The whole process may take more than an hour though, due to the many parts that require assembly. Tools for assembly are not included, and you’ll need an 8-mm L-Wrench, 13/17 mm Flat Wrench, 5 mm L-Wrench, and a Phillips screwdriver. In terms of maintenance, it’s recommended to wipe the rails of the machine before each use. Any grain of sand or small object passed over by the rollers may cause nicks in them, and affect the overall smoothness of the ride. Also, in case the joints of the machine develop squeaking noises, lubrication is required. The internal parts of the machine come pre-lubricated, and should not require any maintenance for a long period of time. Although it may lack a few features compared with other models in this price range (such as incline, for example), the AFG 2.5AE still is a decent elliptical trainer. It features a sturdy construction, smooth and quiet drive, and an automatic magnetic resistance system with 10 distinctive settings. It offers 12 pre-set programs, some of them having several levels of difficulty. It’s an elliptical machine designed for light to medium cardio workouts, interval training, re-gaining strength and stamina, and of course, for losing weight. Even though it’s a bit expensive for what it can offer, it’s still a quality elliptical, available for a fairly decent price / value ratio.